Brand partners with Dalton Maag to create Airbnb Cereal. Airbnb has a multi award-winning brand identity, but it never settled on a typeface that felt quite right. Until now. The company has released Airbnb Cereal, a sans-serif typeface that can be used across all branding touchpoints, from billboards to its app. Airbnb Cereal is available in six weights: light, book, medium, bold, extra bold and black. It also sports a deeper x-height than the company’s previous main typeface, and apertures that shrink based on the weight of the type in use. In an interview on the brand’s blog, design lead Karri Saarinen explains how they initially experimented with screen-optimised system fonts, but were unable to find one that fitted with Airbnb’s design language, and that would work across print and digital platforms. When it came to naming the font, design lead Derek Chan says they were looking for something “playful, open, and simple… with a touch of quirk”. A heartwarming tale from the annals of the company’s history provided the perfect solution. Founders Brian Chesky and Joe Gebbia, in huge amounts of debt with a site that no one was visiting, launched a last-ditch promo that saw them shipping self-assembled boxes of cereal (‘Obama Os’ and ‘Cap’n McCain’) to Airbnb hosts and members of the press. The press ate it up, literally and figuratively, and it was a turning point for Airbnb. The typeface follows a trend for brands to put increased emphasis on unique type design. 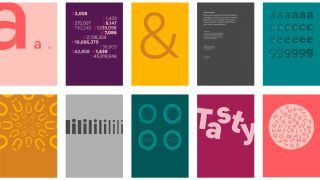 Airbnb Cereal joins the likes of YouTube Sans, IBM Plex and Coca-Cola’s TCCC Unity in the collection of bespoke brand typefaces.